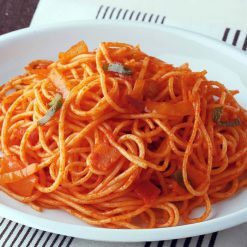 Gently flavored spaghetti Napolitan with a tomato base. Made with 100% durum semolina pasta. Simply microwave or boil in bag and enjoy. Each package is 270g and arrives frozen. “Napolitan” refers to spaghetti dishes that are flavored with tomato ketchup. It is a Western-style dish that arranges Western pasta to fit Japanese tastes. 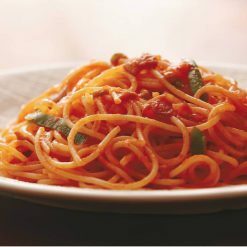 It is a uniquely Japanese dish that does not exist in Italy, the original home of spaghetti. The bacon contains gardenia colorants. Our spaghetti Napolitan is made with a mild ketchup-base sauce. Durum wheat is a very hard wheat. Semolina refers in this case to the course wheat middlings of durum wheat, but can also refer to middlings from other grains. Semolina contains folate, thiamin, selenium, and iron. Sugarlady’s frozen food provides an easy way to enjoy this nostalgic dish. 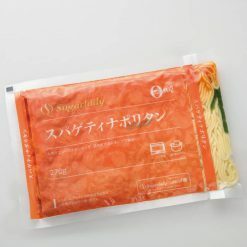 The spaghetti Napolitan’s packaging is designed to be compact and takes up very little space in the freezer, allowing you to have lots of tasty meals on hand without worrying about your freezer filling up with bulky boxes! Microwave: Place the spaghetti Napolitan (still frozen, still in its bag) in the microwave. The side of the bag with a steam vent should be facing up. Do not cut any additional holes in the bag. In a 500W or 600W microwave, cook for approximately 4 minutes 30 seconds. (The vent allows steam to escape so that there is no need to worry about the bag bursting). Boil: Place the spaghetti Napolitan (still frozen, still in its bag) in an ample quantity of boiling water. Cook for about 9 minutes. This product contains spaghetti (durum wheat semolina), tomato paste, vegetables (onions, bell peppers), tomato ketchup, rapeseed oil, sugar, mushrooms, bacon (pork), table salt, potato starch, chicken extract, natural cheese, spices, plant lecithin (soybeans), gardenia colorants.. This product is not suitable for anyone with allergies to milk, wheat, soy, chicken or pork.